- We've been experiencing some disrespect for our precious Vintage Scuba Tanks from our usual HydroTesting dive shop. So, I looked around and found this HUGE Hydrotesting service in Rice, MN. It's called Hydrostat, Inc. and they re-qualify cylinders of all kinds from huge propane tanks to welding, CO2 beverage, medical, and... Scuba! - Ron took them 2 tanks that our former guy would not test due to some internal rust. Hydrostat not only tested them but shot blasted the inside to remove the rust... They look like new inside. Total for both services was $25 per tank. $12.50 for Hydro and $12.50 for shot blasting! - Rich and I brought them 18 tanks plus another one from Ron. 3 aluminum 80s, two unconverted (to scuba) oxygen tanks with O2 valves still in them, 3 bushing 38s without bushings, 3 Sportsways 42s with the .750-16 UNF straight thread, 2 USD 38s with standard 3/4 O-ring thread, 1 Vigo 18 tank without bushing, 1 18 CF trank with 1/2" tapered thread, 1 Nemrod 27 cf tank with 1/2" tapered thread, Rich's odd Jack the Frogman tank without the bushing... I think there's one more I can't remember. Quite an odd-ball mix of Vintage compared to the usual modern Scuba tanks. - Anyway everything was re-qualified just fine except Richs odd tank. All were some form of vintage Scuba tank and we got no dirty looks or snide comments. Everyone was courteous and efficient. AND, the total price was $258.75 for 19 tanks! That's $13.62 each! 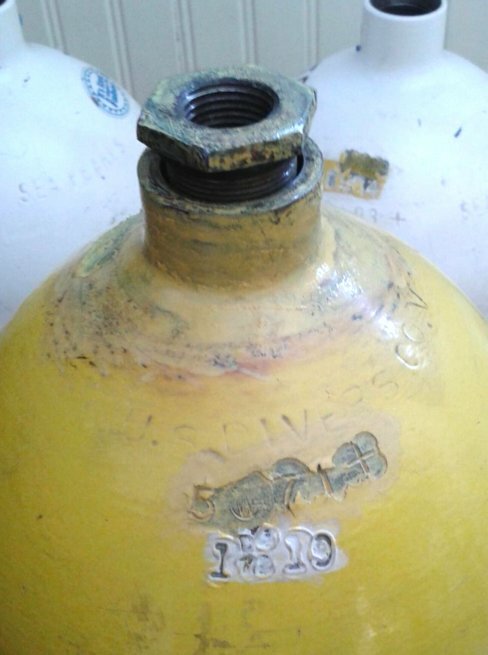 - I am happy to recommend Hydrostat, Inc. for your vintage scuba tank hydrotesting! Rich's "Odd" Jack the Frogman tank has a straight 1" thread that is fine and they do not have the spud for it. They said the spud would cost over $300. My issue here is that I have modern LP steel tanks (Worthington/XS), and hydro shops here will not give + ratings (ummm, the REE number is stamped right on them!)... It would be fun to get my vintage 72s (Norris and PST) back to + rated, but that too seems hopeless at the data/documentation is "too hard to find". Here is a question for Luis, is the assignment of the plus to a tank documented by the hydro shop. I ask because I always get a copy of the test results data sheet. No where on the sheet do I see a spot for documenting that the cylinder was assigned a plus or not. If you have the test data and know the ree of your tank you can determine if the tank qualifies for the plus. That said would you stamping the plus on the tank be a violation of regulations even if the data says it has qualified for the plus. Yes, they are supposed to document it. It is kind of the old EMS saying: “if you didn’t document it, you didn’t do it”. Notice the words "supposed to". Most facilities don’t bother doing the + stamp so they don’t have a special column on the form to mark it, but I have seen it marked with a + next to the pass. If the cylinder is not stamped with the REE number, they are supposed to attach a copy of the document that provided the REE number. When my LDS (the one that closed in 2015) did in house hydro testing I provided a copy of my REE calculations and supporting data. They stapled it to the back of the hydro data sheets. I met the local DOT inspector at the LDS a couple of times and she like the documentation I provided. I even asked it if she would like me to stamp my calculations with my engineering license seal, but she said the calculations was more than sufficient. On a previous occasion that same LDS was fined a few thousand dollars just for taking short cuts and being sloppy on their record keeping. Some of the short cuts that they got hit for seemed ridiculous, but it was obvious that they got a bit lax and were missing some data, like incomplete serial numbers, etc. If you stamp your own + on a cylinder, it is not likely that you will ever get caught, unless an LDS knows that the local hydro stations never does the + stamping or a similar situation. It is very easy for anyone to verify if a + stamp is legitimate. The RIM number on the hydro stamp can be easily checked at the DOT website and the phone number of most facilities is listed. Someone would have to go through the trouble of calling the facility and the facility has to find the records. It will probably will not happen. But if it did, in theory, that cylinder could be condemned for having false markings. Again not likely. What is really bad is some of the pictures I have actually seen on the internet (in ScubaBoard, etc.). I have seen “+” stamps that were actually done with a chisel. The indentations were very symmetrical (at 90 degrees) and looked OK. But because they were done with a chisel they were too deep. And the depth of the indentation is actually very solid reason to condemn a cylinder. An indentation that is too deep can be considered a gouge. A legitimate stamp has a flat surface that will not allow any indentation to go too deep. As opposed to a chisel that is design to cut as deep as possible. In VSS someone once tried to argue that it was common practice and perfectly legitimate to use a chisel to mark the “+” stamp. He provided pictures of cylinders that actually (from the look of the pictures) had deep + stamp gauges which if anyone was paying attention they should have been condemned (just due to the depth of the “+ stamp”). The CGA (Compress Gas Association) documents clearly states the maximum depth allowed for any gouge or pit, and the depth of an external gouge like a stamp is easily measured. I have also seen pictures on the internet with VE stamps that looked questionable. Out of pure curiosity I looked up the RIM number on the DOT site and it opened a few more questions. I couldn’t really tell if the hydro facility was still in business. It probably was but I didn’t look into it further due to lack of interest. Now that my LDS with in-house hydro facility is closed, I am going to have to start shopping for a new hydro facility in a year or two. The one that Eben mentioned sounds good, but it is a bit of a drive for me. I am even considering taking my cylinders to a friendly dive shop with their own hydro equipment down in Boston. It is a bit of a drive, but I have enough cylinders that it could be worth it. My hydro place has informed me they will not be doing 1/2" tanks....... See mushroom cloud! I have a couple of options to check out that are reasonably close. We'll see. I'm still sitting on a pair of WK 38's that the hydro place refused to test. Maybe I can get them done yet. I too am kind of shopping for a good hydro place. The one in Cincinnati that I have used refuses to do plus ratings and I have to stay on them about doing the round out procedure (pretest). The one I thought I had found to be great in Toledo raised the price to "ridiculous" after I sent them 5 tanks, no prewarning (not ethical or cool). I need the tanks for Sea Hunt this year so I have no choice. I wish I would have just had them tested in Cinti instead of sending them up to Toledo. It seems like we vintage tank users get hosed and harassed a lot when it comes to Hydro testing. Eben you should make sure you tell your new place how much you appreciate them. - The "odd" Jack the Frogman tank that they don't have the spud for... Rich and I got the idea to just ASK if they'd give the hydrotest a try with the adaptor and their tapered 1/2" spud. He said, "I can't guarantee anything but we can sure give it a try". That tank has had two long ago hydros... One from the factory and one with the adaptor. So, there's a good chance it can pass with the adaptor again! - SwimJim... I would say "YES"... See about getting the tanks they refused to test over to HydroStat. There's no voodoo rule making. They do hydrotesting... Actually they call it "Re-Qualifying"... Of all types of cylinders and they're certified up the ying yang from organizations and government... They KNOW what the regulations are and also what they aren't. No mystery. - No VIP stickers required - Why? Because the DOT specs for a hydrotest include a visual inspection. If you have a tank with a fresh hydrotest stamped on it, it should need no VIP sticker the first 12 months after the hydrotest. - Aluminum Tanks VE - Among the tanks I brought in were three aluminum 80s. Two of them were 1989 Mfg... Which is just barely into the "Good" aluminum years. The other was only 5 years old. The two older 80s came back with a "VE" included in the new hydro stamp. Meaning Visual Eddy tested. The newer 80 simply had the hydro stamp without the VE. According to hydrotesting regs, all three had a visual inspection along with the hydrotest. But they only did the Visual Eddy on the old AL80s. - Wholesale Limitations - Hydrostat does cylinder re-qualifying. They don't service valves or clean threads and check to be sure their drying process works. Most of the tanks I brought had the valves removed and just a plug in the end. But the three AL80s and two oxygen tanks had the valves installed. Hydrostat re-installed the valves solidly... I had to use my tank vise to get the valves off the AL80s and there was a little water still in them. No problem for me to sop it up and dry them out next to the heat register. But I would not have known had I not taken the valves off and looked inside. Also, Ron had a couple of tanks shot blasted to remove rust on the interior. One of those got a buggered up thread. He was able to chase it with a tap so that the valve would screw back on fine. None of the others had moisture inside or thread damage. This is out of 21 tanks of all sizes, shapes, threads, etc. It certainly gave them all kinds of chances to say "no" but they requalified every tank except Rich's odd one. Now that one may pass, too. - These are services (I suppose) the local dive shop is supposed to take care of when they pay Hydrostat $13 and then charge us $30+ for transportation and re-assembling the valve and tank. I accept doing this stuff myself as a consequence of going direct with the hydrotestor. - Rob - Yes, we were very appreciative to "Mike" our contact at Hydrostat. We told him about our Vintage Sport, and how these tanks are valuable antiques to us... He said, "Yes we noticed they were all very old cylinders..." Totally polite and respectful of our old tanks. - Rich's odd Jack the Frogman tank passed the HydroTest using an adaptor bushing to fit the 1/2" tapered thread testing spud! As mentioned elsewhere, this tank came equipped with an adaptor bushing and a 1/2" J-Valve. It's not the familiar tapered thread bushing, however. Its a 1" Fine straight thread with an O-Ring. Anyway, nobody had the spud. We asked Hydrostat if they'd consider doing the test using the adaptor and they did! A brand new Jan 2019 Hydrostamp! I haven't run into a tank with the fine threads that you mentioned. Can you measure the threads per inch? Also would like to see the ICC or DOT and other markings on it. Thanks. - Its not my tank and resides at Rich "50,001 Questions" house. So, I don't have ready access to take measurements whenever I want. But now that the hydro has been done, we'll be getting together to re-assemble the bushing, valve, and tank. So, I'll try and get that information then. I have to laugh folks. You all think YOU have HydroStat problems, come over here and see what hydro problems are really all about. It is 1948 over here, with all the dangers that come with it. By the above statement, I mean that here, there are REALLY DODGY tank inspections, let alone Hydro. I personally know three dive instructors that eventually had to start conducting their own Hydrostatic tank testing due to un-sat Hydros done here. Think "Gee, I have a set of steel number/letter stamps, I'll just go 1958, and stamp that this tank is good." This and the inability of shops over here (ARAMCO is not in this group) that have internationally recognized AND trained personnel that are truly capable of doing hydro-testing as well as the correct equipment set to do it. Several tanks were sent south to Jeddah for Hydro, by instructor Mark Perry, who was here in Tabuk for years, with two 6351 Luxfer tanks that were verified fails in anyone's book, with known and visible sustained load cracking (SLC inside and at the valve threads). Both came back marked as good, Thus Mark went back to Britain, got certified and returned to conduct his own VIS and hydro. The problem now is that he has been gone for a year and a half and there is no one here left now that we trust to hydro.